WITH THE INTRODUCTION OF A NEW IMPERIAL SUITE AND PIONEERING PERSIA & SILK ROAD JOURNEYThis year Golden Eagle Luxury Trains, the world’s leading operator of luxury rail tours by private train, celebrates its 30th anniversary with the introduction of a remarkable new rail journey: Persia and the Silk Road. This new 16-day route aboard the elegant Golden Eagle train will sweep across Central Asia and Iran to offer a fascinating glimpse into these mystical countries, rarely experienced by the western traveler. In addition, due to high demand, 2019 will see the unveiling of a brand new Imperial Suite, the most spacious cabin available on the Golden Eagle – the original two Suites have almost sold out for this year’s journeys already.NEW IMPERIAL SUITEFollowing unprecedented demand, the Golden Eagle will welcome a new Imperial Suite from May 2019, bringing the total number of top suites aboard the luxury hotel on wheels to three. The new Imperial cabin, measuring a spacious 120 sq ft, will benefit from a king-size bed, private en suite bathroom with power shower and under-floor heating, and the option of in-suite dining. Imperial passengers are also provided with a private car and guide at the destinations visited along the way.PERSIA & THE SILK ROADFollow in the footsteps of ancient traders through some the world’s most remote corners on this unique new rail journey between Almaty and Tehran. The adventure begins in cosmopolitan Almaty, where the Golden Eagle is waiting to whisk passengers westwards across Kazakhstan, Uzbekistan and Turkmenistan to see some of the most magnificent, yet rarely visited, sites from the ancient world. Highlights on the Silk Road include: viewing the world’s oldest Koran at Tashkent; discovering the stunning architecture of Samarkand, once one of the most important cities in Asia; and stepping back in time in the ancient cities of Bukhara and Khiva, both UNESCO sites and significant trading posts at the crossroads of Asia. Also visited is Darvaza’s famous gas crater which has been burning for over 40 years, and the modern city of Ashgabat, known as the ‘Las Vegas of the Kara Kum’, built on the ruins of the Silk Road city of Konjikala. After a change of wheel sets at the border town of Sarakhs, the Golden Eagle crosses onto the standard gauge tracks of Iran for the second leg of the voyage to the heart of Persia. Head off the beaten track, albeit from the comfort of a luxury hotel train, to trace the legacies of the Persian Empire. 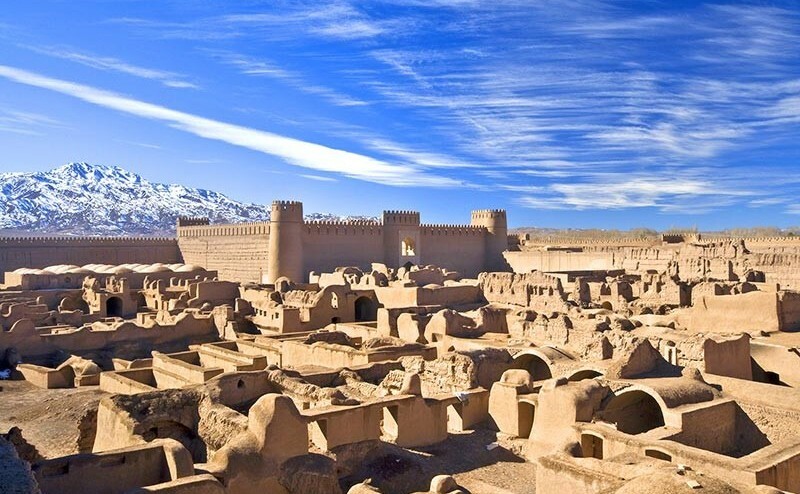 Here there will be opportunities to visit the sacred city of Mashhad, as well as Yazd – thought to be one of the oldest cities in the world, and the well-preserved castle at Rayen. Lunch in the Prince’s Garden at Mahan, the Hamam Ganj Ali Khan complex at Kerman and a trip into the Shahdad Desert to view the Kalouts, the beautiful, ever-changing sand formations carved by the wind, all follow. The final stops ahead of Tehran, the journey’s end, are Isfahan, once Persia’s capital, and famous for its array of historical monuments and life-giving river, the Zayandeh-Rood; Persia’s cultural capital Shiraz; and the impressive ruins of Persepolis, perhaps Iran’s most important archaeological site dating back to the 6th century. The trip concludes with two nights in Tehran. Price: from US$20,395pp based on 2 sharing, including 3 nights’ hotel accommodation (1 in Almaty, 2 in Tehran), 12 nights’ on the Golden Eagle in Silver Class, all meals, drinks with meals (with generous allowance of quality wines, excluding Iran where no alcohol is permitted), fully guided off-train excursions programme, porterage, arrival and departure transfers, services of a Tour Manager and gratuities. Flights are extra. Departs: 2 October 2019. 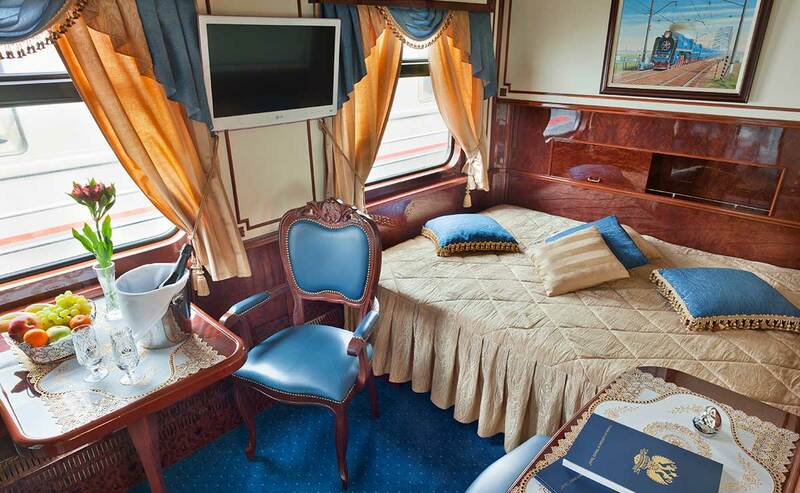 Trans-Siberian Express: One of the world’s greatest rail journeys, from Moscow to Vladivostok. Winter Wonderland: The Trans-Siberian route but in winter, when the scenery is overwhelmingly beautiful. Trans-Mongolian Express: Rail it from Moscow to Ulaan Baatar to witness Mongolia’s Naadam Festival. Available outside of the festival dates as the Ulaan Baatar Express. Arctic Explorer: Traveling between St Petersburg and Moscow, this quest for the Northern Lights heads deep into the Arctic Circle to Kirkenes. Christmas and New Year departures. Land of the Midnight Sun: Journey between Moscow and St Petersburg to the Arctic Circle in summer to celebrate White Nights season. Caspian Odyssey: Explore the South Caucasus and trading posts of the Silk Road from the Armenian capital of Yerevan to Almaty in Kazakhstan. For a shorter version, finishing midway in Baku, opt for the South Caucasus Explorer. Silk Road: Retrace the ancient trading routes on this epic journey stretching from Beijing to Moscow, passing through Kazakhstan, Uzbekistan and Turkmenistan, reaching areas only accessible by train. A shorter Taste of the Silk Road journey between Moscow and Almaty is also available. Persian Odyssey: Travel from Iran’s capital Tehran, via the Silk Road, to Moscow.